Patricia ~ All of the dancers filled out random questions about themselves. The answers are below in their photo bios! Most of my friends and family call me Trish. As a child it was usually carrot top or rusty. I started dancing in 2005 mainly as a way to get fit (obviously that didn't work) and loved it. 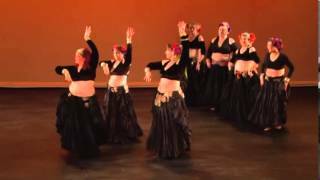 After meeting some of the women in my first class I realized that this was for me; size, age, none of that mattered in bellydance all that mattered was that you enjoyed dancing and had fun doing it. Family summer road trips. My parents would throw all us kids in the van and head out, a lot of the time it would be to go to BC where 3 of my mom`s sisters lived. Stopping on the side of the road in the mountains so we could have a snowball fight in July was always great. Crafting is my favourite way to relax be it crocheting, knitting, beading, sewing, you name it if I can make it with my own two hands its good. Unless I drop a stitch or loose count then there goes the relaxing. I can be a total klutz so there are plenty to go around especially when it comes to explaining to people just how it was that I hurt myself. Seeing the man my oldest son has become after raising him by myself for the first twelve years of his life. If you had a full day to do whatever you wanted, what would you do? If it was a full day where I actually slept the night before then I’d take the dog for a nice long walk, sit on the couch with a craft project and a glass of wine and veg. I would take my playbook with me to the spa so that I could shop on ebay for more sparkly bits while getting pampered for the day. What is your favourite costume item that you own? My favourite costume item, really it would be like saying which of my kids is my favourite. I do have a few kuchi pieces that I want to use as focal pieces on belts or something just afraid that once I put them on something I’ll end up not liking it and sticking it in a drawer. Also have a couple beautiful cholis that I knew would never fit but I like to think of them as art for my sewing area. I have three kids (2 sons, 1 daughter), a loving husband, a grand-daughter and another grand-child on the way and of course my lovely daughter-in-law. I also have 2 furry kids; my psycho ADHD Boston Terrier named Snuggle Bunny and my very talkative Balanese kitty named Sky. All strong women who don’t care what others think of them and do what makes them happy. My best trait would be that I’m a people-pleaser, I just want everyone to be happy. I’ve been told that’s also my worst trait as it ends up I put myself last when it comes to everything. When you were a child what did you want to be “when you grew up”? When I was little I wanted to be a nurse. Does sewing your own finger closed whenever you cut yourself count for this one? I am an executive assistant with the Province, not even close. If you were to take up a different style of dance, what would it be? I’ve always wanted to learn Latin dancing but my husband has two left feet and I’m not going by myself. Well my husband and kids are big enough so they should be to get themselves out. I`d have to grab the cat and dog because neither one of them is very bright, and if I was strong enough my treadle machine and antique singer. I regret not gaining the self confidence to try new things when I was younger and had more energy to do them. Goonies, loved it as a kids and loved it watching it with my kids. I guess it’s my favourite because a bunch of “loser” kids save their town. Love the underdog.